According to TSN, the NHL has raised the Salary Cap $6-million from $44-million to $50.3-million. Under the terms of the post-lockout CBA teams are required to spend a minimum of $34.3-million. The baseball card market looks to get a little bit smaller as Upper Deck has launched a hostile takeover bid for rival sports card maker Topps. The Upper Deck Co. said on Monday it would launch a hostile tender offer to acquire baseball trading card company Topps Co. Inc. for about $425 million. Upper Deck, which publishes sports trading cards and other memorabilia, said its $10.75 per share offer was superior to Topp’s existing deal to be acquired for $9.75 per share by a private equity firm and an investment group led by former Walt Disney Co. chief Michael Eisner. Upper Deck said its cash offer is not conditioned upon any financing arrangements. While taking a short pause from trying to find Versus on their cable package, the National Hockey Leagueâ€™s Board of Governors has approved four minor rule changes for the upcoming 2007-2008 season. Rule 24 — Gross Misconduct. The term “Gross Misconduct” was eliminated from the rule book. Any act that would have been assessed a Gross Misconduct penalty will receive a Game Misconduct penalty. Accumulated Game Misconduct penalties can lead to fines or suspension. Nothing too important here and not effect on the game or the players, it just simplifies the rules slightly while maintaining the original intent of the rule. Rule 25 — Penalty Shot. A player may be awarded a penalty shot if he is fouled on a clear breakaway outside his defensive zone (i.e., anywhere in the neutral zone or in the attacking zone). Previously, a penalty shot was awarded only when the player on a clear breakaway was fouled on the attacking side of the center line. This could be slightly more interesting in expanding the area of the ice where the referee is allowed to award a penalty shot. That being said, even in the â€œnew NHLâ€ penalty shots are still quite rare (as are â€œclearâ€ breakaways) and this change may give a team an extra penalty shot every 20 games or so. Even with the extra opportunity on occasion the overall success rate of penalty shots in the league sits at about 30%, so were really talking about maybe an extra goal or two a season. Rule 56 — Interference. Referees were given discretion to assess a major penalty and a game misconduct when an injury results from an act of interference. Previously, only a minor penalty could be assessed for interference. This rule just gives the referees more flexibility. However, running it through my mind, most actions that would result in an injury during an interference penalty already have their own penalties. The only exceptions I could think of were headbutts and kicks to the groin, but then again youâ€™d probably get punched for that and that would be a fighting major. Rule 76 — Face-offs. All face-offs must be conducted at one of the nine face-off dots painted on the rink. Previously, there had been instances, such as when a puck left the playing surface, which caused the face-off to occur on unmarked ice, parallel to the dot nearest the place where the puck departed. This just takes some subjectivity of where the face-offs are conducted when the puck goes out of play. I will be interested to see how they determine between the attacking and neutral zone face-off circles when the puck goes out between them. I donâ€™t expect this rule change to affect too much, but it could be a real interesting discussion if it occurs at a point with 2 seconds left and a team down by a goal. Obafemi Martins a striker for Newcastle United and Nigeria appears to have narrowly escaped an attempt on his life in what appears to be a retaliation for missing a game for the Nigerian National Team. The horror ordeal began when three masked gunmen surrounded Martins at a petrol station near his plush apartment in Lagos, Nigeria, late on Monday night. The player, who is now recovering in Italy, said: â€œI didnâ€™t know their mission but they looked scary and mean. My nerves were completely dead when I saw the guns.â€ The terrified Magpies ace tried to reverse his car to get away but was blocked by another car parked behind him. Gunshots were fired at the windscreen and through the passenger window. Martinsâ€™ mate Remi Onipede was hit but the St Jamesâ€™ Park hero managed to run for cover before cops arrived. The gang did not steal the car and Martins now believes their motive could have been murder â€” as payback for him missing a recent international â€” rather than robbery. He said: â€œIf you are attacked by armed robbers, they only threaten you and take whatever they want but these guys were only after my life. Fortunately, no one was killed in this occurrence. Its amazing that some of these soccer (and Raider) fans can get so worked up over their team they fell some uncontrollable urge to commit random and non-random acts of violence against just about anyone. Accodring to ESPN Michael Vick’s Virginia home was robbed. According to a police report obtained by the Atlanta Journal-Constitution, the home in Surry, Va., was broken into between May 7 and May 18 and a number of expensive items were removed. Three plasma televisions, two floor buffers, a wet/dry vacuum, a washer and dryer and a $17,000 leather sofa were taken from the Atlanta quarterback’s home. So aside from Vick’s bad personal choices, he can’t pick his friends either because this robber does smell of his buddies getting theirs before its too late. Of course it is entirely possible those items may show evidence from dogfighting, but my money is on they just wanted new things purchased by someone else. Chris Pronger had his second brain-fart of the Playoffs with this hit on Ottawa’s Dean McAmmond and its going to cost him a suspension for Game 4 of the Stanley Cup Finals. As for the suspension the ESPN “Experts” disagree on whether or not the suspension is the right call. Pronger’s previous actions in the Playoffs made this suspension; I can’t deny he elbowed him in the head and that the player was hurt. Of course the Ducks were one of the most penalized teams in the NHL this season playing consistently on the verge of out of control. There is no doubt this will hurt the Ducks as Pronger plays nearly 30 minutes a game and is one of the cornerstones of the Duckâ€™s defense, power play and penalty kill. Look for Ottawa to win tonight and head back to Anaheim with the series tied 2-2. In an interview being conducted right now on ESPN Radio show of Stephen A. Smith, Kobe has said he wants to be traded and no longer wants to play for the Los Angeles Lakers. He also went on to say that Jerry Buss mastermined the Shaq trade, management refused to deal for Carlos Boozer, Jason Kidd, and Ron Artest, told two different plans for the team to Phil Jackson and himself. Kobe has also stated he bit the bullet on speaking out to support the franchise, but the current interview blitz was prompted by a “Lakers Insider” reporting to the Los Angeles Times that Kobe was the reason the Lakers dealt Shaq. Earlier in the day, Bryant said team owner Jerry Buss masterminded the trade of Shaquille O’Neal — and Shaq later confirming Kobe’s account. O’Neal was traded to the Miami Heat after the 2003-04 season, and the long-held belief has been that the deteriorating relationship between O’Neal and Bryant was a factor in O’Neal’s departure. In response to the Times’ story, Bryant, who was interviewed by Stephen A. Smith for a Philadelphia Inquirer, said Buss “called a meeting with me after he spoke with Jim Gray [of ESPN] to talk with him about Shaq’s future in the middle of the 2004 season. “He met with me at the Four Seasons Hotel here [in Los Angeles] across from Fashion Island, which is now the Island Hotel,” Bryant told Smith. “I went up to his penthouse suite. [Buss] looks me dead in the face and says: ‘Kobe, I am not going to re-sign Shaq. I am not about to pay him $30 million a year or $80 million over three years. No way in hell. I feel like he’s getting older. His body is breaking down, and I don’t want to pay that money to him when I can get value for him right now rather than wait. Reached afterward, O’Neal told Smith that be believed his former teammate beyond reproach. “I believe Kobe 100 percent,” O’Neal said when reached in Los Angeles. “Absolutely. There’s no doubt in my mind Kobe is telling the truth. I believe him a thousand percent. And now Bryant, who reportedly has made it clear to the Lakers that he may see fit to terminate his contract in two years, told Smith he wouldn’t continue to wait for Buss to build the roster around him. Bad news for the Lakers, the inpet management has driven the franchise into a disaster area. I can’t say I don’t blame Kobe, the team around him stinks. The only a handful of players actually work hard, fewer can stay healthy and many more of them are just bums. He’s carried the team for 3 years and my guess is he is just burned out doing it and staying slient and supporting the franchise. Nice work by the Buss family there. If Kobe Bryant calling the ownership out, management by committee preventing any moves to improve the team, and bad personnel decisions weren’t bad enough for the Los Angeles Lakers now their owner is making bad personal decisions by driving drunk and getting arrested. – Los Angeles Lakers owner Jerry Buss was arrested early Tuesday for investigation of driving under the influence of alcohol. The 74-year-old Buss was taken into custody shortly before 1 a.m. after he drove his gold Mercedes-Benz station wagon the wrong way on a street in an unincorporated section of Carlsbad that has double yellow lines, California Highway Patrol officer Tom Kerns said. A 23-year-old woman in the vehicle with Buss wasn’t arrested, Kerns said. Knowing the reputation of Dr. Buss, it wasn’t his granddaughter. SOme players dont react to hecklers in the best way, Vernon Wells isn’t one of those players. No he didn’t beat the guy or threaten him, he just reacted with humor of his own when he tossed a baseball to a guy who had been heckling him all game. Here is your ball! Can you please tell me what gas station you work at, so when you are pumping my gas, I can yell at you!!! Now sit down, shut up and enjoy the game. Give him credit it, its creative AND funny. 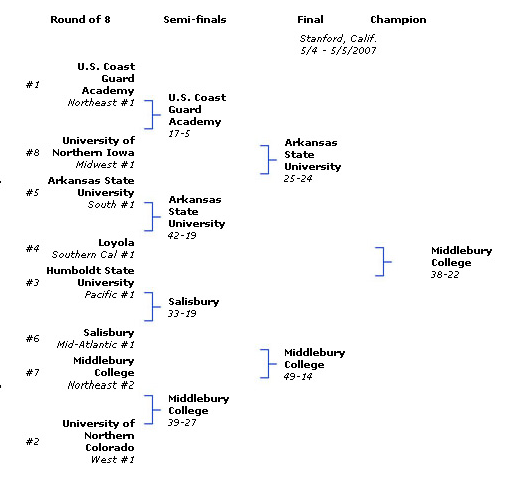 The USA Rugby Collegate National Championships wrapped up this weekend with University of California winning the Division I crown (no big suprise there) and Middlebury College winning the Division II crown. 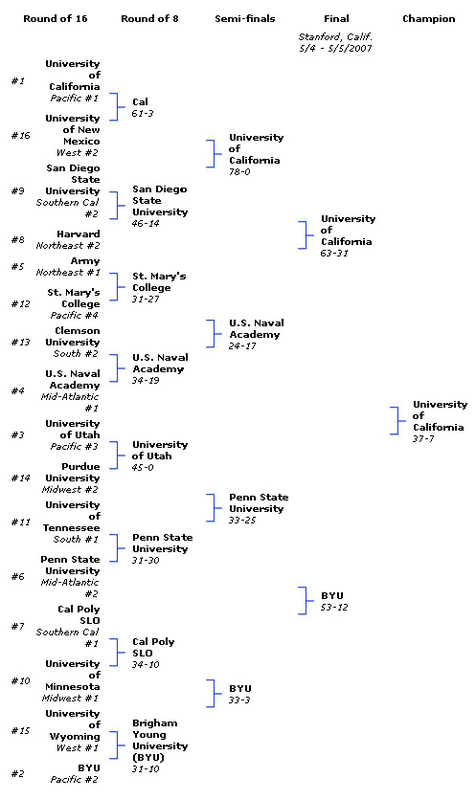 On a related note Penn State won the Women’s Division I (22-21 over Stanford) and Iowa State won the Women’s Division II (26-19 over UC Santa Cruz).